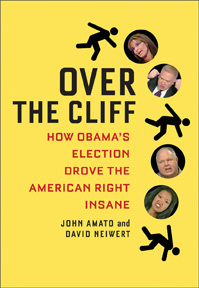 “A giveaway moment”: David Neiwert, “Tea Tantrum Indeed: The right-wing populists have officially taken over movement conservatism,” CrooksandLiars.com, April 16, 2009. “Rush Limbaugh”: Media Matters, “Limbaugh defends AIG from ‘lynch mob’,” MediaMatters.org, March 18, 2009. “Glenn Beck had”: David Neiwert, “Beck & Super Friends decry ugly populist threats of which they of course are innocent,” CrooksandLiars.com, March 19, 2009. “It’s accurately described”: Wikipedia, “Producerism,” http://en.wikipedia.org/wiki/Producerism. “Chip Berlet”: Chip Berlet, “The Producerist Narrative in Repressive Right Wing Populism,” Political Eye (Political Research Associates). “The producerist narrative”: See Steven Watts, The People’s Tycoon: Henry Ford and the American Century (New York: Alfred A. Knopf, 2005), page xi. “Glenn Beck has”: David Neiwert, “To attack Obama’s New Deal, Beck invokes Henry Ford — the Nazis’ friend,” CrooksandLiars.com, February 12, 2009. “It seems to have vanished”: David Chalmers, Hooded Americanism: The History of the Ku Klux Klan (Durham: Duke University Press, 1987), pp. 30-35. “The one exception”: Glenn Beck, CNN Headline News, July 30, 2008. Transcript at http://transcripts.cnn.com/TRANSCRIPTS/0807/30/gb.01.html. “Ron Paul also drew”: David Neiwert has previously reported extensively on the right-wing extremists attracted to Ron Paul’s 2007-08 presidential campaign, particularly at his own blog, Orcinus (dneiwert.blogspot.com). See esp. “The dark side of the ‘Paul Phenomenon’,” November 14, 2007; and “The clearing view of Ron Paul,” January 16, 2008. “Don Black”: David Neiwert, “Surviving Ron Paul,” Orcinus, January 10, 2008. “Virtually every far-right entity”: Neiwert has described Paul’s background as a right-wing extremist at Orcinus,along with his co-author at the blog, Sara Robinson, including: “Man of the Hour,” June 7, 2007; “Ron Paul vs. the New World Order,” June 8, 2007; “Ron Paul’s record in Congress,” November 11, 2007; and “Ron Paul’s Far Right Foundations,” January 8, 2008. “Palin had been”: Max Blumenthal and David Neiwert, “Meet Sarah Palin’s radical right-wing pals,” Salon.com, October 10, 2008. “In her singular debate”: Transcript of the Sarah Palin-Joe Biden vice-presidential debate, October 3, 2008, at http://www.cnn.com/2008/POLITICS/10/02/debate.transcript/index.html. “Moreover, after the election”: See, e.g., Media Matters, “Beck claims Bush, McCain were ‘progressive,’ adds that ‘the country may not survive Barack Obama’,” MediaMatters.org, Sept. 23, 2009. “When Palin abruptly”: David Neiwert, “Beck’s prediction: Sarah Palin positioning herself for third-party run — and a third party will win in 2012,” CrooksandLiars.com, October 31, 2009. “Even before the election”: David Frum, “Palin the irresponsible choice?,” National Post, August 29, 2008. “After the election”: Mark Lilla, “The Perils of ‘Populist Chic’: What the rise of Sarah Palin and populism means for the conservative intellectual tradition,” Wall Street Journal, November 8, 2008. “Palin’s defenders”: William Kristol, “Panicked Over Palin,” Washington Post, July 6, 2009. “Replied Frum”: David Frum, “Good reason to fear Sarah Palin,” National Journal, July 8, 2009. “Joseph Aistrup”: Joseph Aistrup, The Southern Strategy Revisited: Republican Top-Down Advancement in the South (Lexington: University Press of Kentucky, 1996), pp. 8-9. “There was strong dissent”: Philip Klinkner, “Race and the Republican Party: The Rise of the Southern Strategy in the Republican National Committee, 1960-64,” Paper presented at the American Political Science Association meetings, Chicago, 1992, p. 24. “Kentucky Senator”: George Bailey, “A Republican Footnote,” Reporter, May 23, 1963, p. 14. “Nonetheless, it became”: Reg Murphy and Hal Gulliver, The Southern Strategy (New York: Scribner’s, 1971), p. 2. “As Aistrup described it”: Aistrup, The Southern Strategy Revisited, op. cit., p. 19. “Nixon played”: See esp. Rick Perlstein, Nixonland:The Rise of a President and the Fracturing of America (New York: Scribner, 2008), pp. 445-448. “As Aistrup described it”: Aistrup, The Southern Strategy Revisited, op. cit., p. 61. “Reagan had a history”: Complete audio, video and a transcript of the speech are available online at American Rhetoric. “His speeches also featured”: Haynes B. Johnson, Sleepwalking Through History: America in the Reagan Years (New York: W.W. Norton, 2003), p. 79. “In a speech”: “Nation: They’ve Got a Little List,” Time, September 1, 1980. “I believe in states’ rights”: Audio of the speech is available at http://www.onlinemadison.com/ftp/reagan/reaganneshoba.mp3. “As columnist”: Bob Herbert, “Righting Reagan’s Wrongs?,” New York Times, November 13, 2007. “In 1981″: Lamis, Alexander P. et al., The Two Party South (Oxford: Oxford University Press, 1990). See also Bob Herbert, “Impossible, Ridiculous, Repugnant,” New York Times, October 6, 2005. “Atwater had employed”: See Tom Turnipseed, “What Lee Atwater Learned, And the Lesson For His Proteges,” Washington Post, April 16, 1991. “As the 1988″: Jack W. Germond and Jules Witcover, Whose Broad Stripes and Bright Stars: The Trivial Pursuit of the Presidency, 1988 (New York: Warner Books, 1989), pp. 159–161. “The ad was not”: “Independent Ads: The National Security Political Action Committee ‘Willie Horton’,” InsidePolitics.org. “However. He had run into trouble”: Julian Borger, “The Brains,” The Guardian, March 9, 2004. “The most notorious of these”: Richard H. Davis, “The anatomy of a smear campaign,” Boston Globe, March 21, 2004. “Rove orchestrated”: Michael Isikoff, “CIA Leak: Karl Rove and the Case of the Missing E-mail,” Newsweek, October 17, 2005. “He also masterminded”: Tom Hamburger and David G. Savage, “Karl Rove took active role in U.S. attorney’s firing, documents show,” Los Angeles Times, August 12, 2009.